After heading home from dinner at wd~50, I happened to run into one of my coworkers outside our hotel in Times Square. He had just come back from seeing The Book of Mormon on Broadway, and was hankering for some late night grub. Given our current location, heading over to "Chicken & Rice" was an easy choice. The vaunted halal cart is located at 53rd & 6th, perhaps the most well-known crossroads in all of Manhattan (at least when it comes to street meat!). At this intersection, you'll find the Famous Halal Guys, who've made quite a name for themselves serving up platters of basmati rice topped with chicken and/or lamb. The story of 53rd & 6th begins with an Egyptian, Mohamed Abouelenein, who started out his career peddling the traditional New York staple of hot dogs. However, in 1992, he made a decision that would change NYC street vending forever: he switched to selling falafel, chicken, and kebabs. His goal was not to cater to the club kids that now frequent the business; rather, Abouelenein wanted to serve his client base of taxicab drivers, many of whom were from the Middle East/Southeast Asia and of the Muslim faith. Serving halal food--food prepared in accordance with Islamic law--thus, was a revelation, and a huge boost to business. Eventually, the cart became a staple of the after-party crowd, and sadly, in October 2006, a late night customer was killed following a disagreement about cutting in line (prompting Abouelenein to hire bouncers). His late night cart on the south-west corner of 53rd & 6th eventually expanded to another kiosk across the street (on the south-east corner, where we ate), serving the same food, and in August 2008, another outpost was opened at the south-west corner of 53rd & 7th to cater to the lunch crowd. 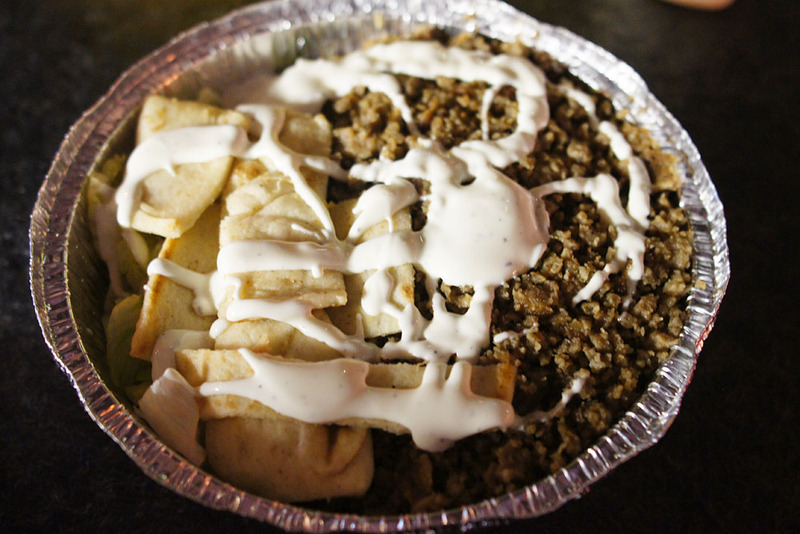 The success of Halal Guys spawned dozens of imitators, one of which operates at the exact same location, but during daylight hours. Interestingly, one competitor, formerly known as Shendy's (north-west corner of 52nd & 6th), was actually absorbed into the Halal Guys empire. And here we are: the plate that built a mini-empire. 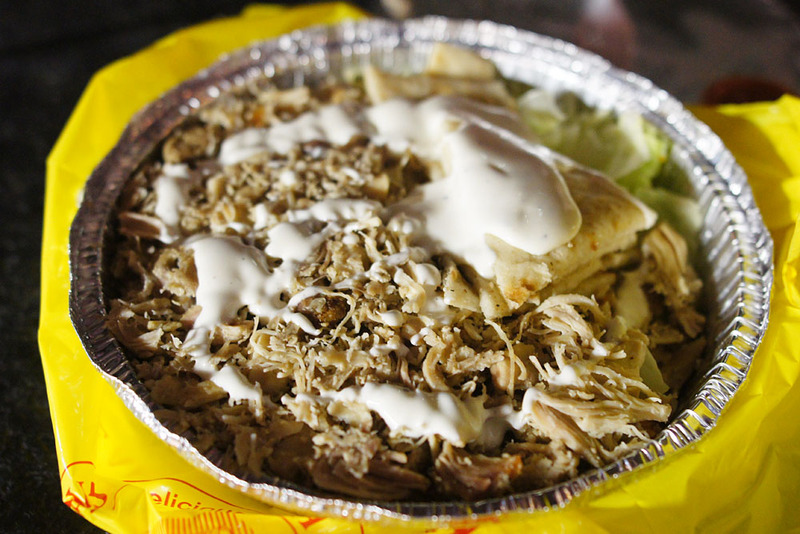 Given that Halal Guys is widely known as "Chicken & Rice," we had to begin with the bird. The famed platter comprises yellow long-grain rice, shredded chicken meat, shredded lettuce, white sauce, and optionally, hot sauce (which some liken to harissa). Though the platter is widely considered "drunk food," I thoroughly enjoyed it while sober. The chicken was perhaps a bit dry, but had plenty of flavor, and the rice really formed the perfect base to things. I appreciated the levity imparted by the shards of lettuce, while everything was tied together wonderfully by the mysterious white sauce. And about that white sauce, no one seems to be able to decipher the condiment's ingredients, though there certainly have been attempts. What I can tell you about the "crack sauce" is that it's fairly creamy, yet still possesses a sort of refreshing zing to it that brightens the dish. Although Halal Guys does serve falafel and pita sandwiches (in addition to a kofte kebab, apparently), everybody that I've talked to seems only to get the chicken and the lamb platters. The lamb version is basically the same as the dish above, but with the obvious substitution of diced lamb for chicken. The gyro meat was perhaps a bit more flavorful, though I think I prefer the texture of the bird. Here, I really enjoyed the application of the red sauce (which is pretty damn hot, by the way), which did a great job lifting the flavors of the dish. My advice would be to get a mixed combination platter and enjoy the best of both worlds. The Halal Guys proudly sing their slogan of "We Are Different." However, given the huge slate of competitors out there at the moment, they probably aren't all that much. That being said, the platters were undeniably satisfying, and a great value for only six bucks a pop. If I were a NYC resident, these guys would definitely be on my rotation. I'm honestly a bit surprised there hasn't been an attempt to capitalize on this halal trend here in LA, perhaps via one of our ubiquitous food trucks. This entry sort of reminded me to mention to you the King of Falafel & Schwarma in Astoria. I love it, I think you might like it if you have time to give it a chance. My work is the building right above the cart. Strangely enough, the whole 9 weeks I spent there, I never went down to the Halal cart, though I've been there plenty of times when I was no where near the neighborhood. No one is ever sure which cart is the real deal. Thanks for helping sort that out. On my last visit, even after a full day of non stop eating I still devoured a whole combo plate. The combination of white and red sauce on the meat, rice and lettuce is ridiculous. love that white sauce. craving it already. Anon: Looks delish! How does it compare? Aaron: Ha! I guess it's sort of the type of food you crave late at night--just doesn't seem "right" to eat it during the day I suppose. Vinh: Exactly. I had no issues wolfing down a platter, even after a 12-course feast at wd~50 just hours earlier! Dan: As am I--is there anything like it in LA? Doah: Hehe, I totally thought of you and that post when I was eating the sauce. When are you going to be back in town? have no idea man. let me know if you ever come across one that's like it. they'd do well to open up around midwilshire area for the lunch crowd and def post-clubbing hours eats up in hollywood or ktown. hey, other than ubuntu and fox at animal, have you tried other vegetarian/vegan restaurants (like cru or real food daily)? any plans to? Definitely post-clubbing; that's their bread & butter in NY right? If you're talking about contemporary American veggie fare, I have not. Indian, Japanese, sure. What's the reason behind the trip? And where else are you eating? Trucks are one thing, but carts are another... MS-13 runs most of the dirty-dog cart businesses that cater to the club kids. Anyone encroaching on their territory would either have to pay a heavy street-tax, or find themselves at the mercy of their Central American fury. I thought about it plenty of times, but this issue always keeps me from giving it a shot. Wow, that's pretty interesting. I never would've associated MS with dirty dogs!